The FB-236-SQ "Square" Flag Display Case showcases both the flag and military awards. It comes with your choice of standard velour color background; Velcro-compatible material is available for a slight additional charge. 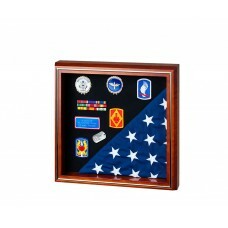 In addition to honoring our Veterans, this piece is also ideal for displaying baby items, wedding mementos, graduation keepsakes . . . the possiblities are endless!